I can’t believe I put off reading this book for so long. As someone who has only recently read David Eddings’ The Belgariad (and loved it), Zoolin Vale had a taste of the same writing. From the first chapter I was intrigued by the characters and completely sold on the adventure they were embarking on. I haven’t read The Red Stone (the first book by Craig Smith) and yet it was not a struggle in any way to follow the story line or characters. In my opinion, that is a true skill that many authors lack. I was lucky enough to get my Kindle copy of Zoolin Vale for free but I would gladly pay for it if I had to. It’s a fun, light and compelling read. I was invested in the characters and their emotions felt real. That is a quality I love in a good book. I particularly enjoyed the suspense of not knowing exactly what the heroes were going to find on their adventure. There were some unexpected twists and an addition of characters late into the book. Thankfully, they in no way stilted the story, but rather added to it. The book follows two separate quests and the manner in which Craig switches from one adventure to the other is flawless. I never felt the need to skip past one story, but felt tied to both stories at the same time. 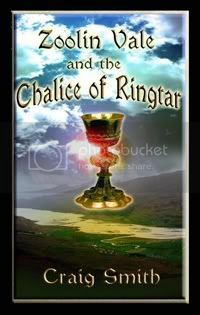 All-in-all I thoroughly enjoyed Zoolin Vale and the Chalice of Ringtar and only have praise for it. It left me wanting more! I can hardly wait for the next installment. < Previous Just another photo blog?